Have you heard of the Live Below the Line Project? I first heard about it on agirlcalledjack.com. It’s a 5-day fundraising project in the UK where you live on 1 British pound a day for 5 days to raise awareness for people around the world who go to bed hungry. If you want to know more, click the banner to the left. While I don’t have the discipline to try this project myself, it did get me thinking about my grocery budget and how I can tweak that in order to fatten up my savings account. Work the pantry/freezer. I’ve got a lot of things taking up space in my cabinets and freezers that’s staple food. Nothing like a good spring clean out so I can refill it with fresh food next month! Limit spending on convenience foods (coffee, muffins, bubble tea, frogurt, etc.) to $20 for the month. Eliminate eating out with two exceptions: my Walking Meetup Group is meeting for lunch on May 3rd, and my birthday is May 19th, and I want to go out to dinner, dang it! Make 2 meals a week vegetarian to save money on meat. I’m going to be trying out several apps for my phone for coupons and rebates on groceries. I already use the Walmart Savings Catcher App, and have $11.67 in there. Apps I will be trying: iBotta, Checkout51, Shopmium, Extreme Coupon Finder. Websites I will be trying: grocerysmarts.com, eBates.com. Try to convince The Hubs to hang some of our clothes on a line to save the $1.50 in dryer costs. You’ll notice that I haven’t included a list of my dry spices. This is because that list is EXTENSIVE. I also did not list the standard pantry ingredients for baking like sugar, flour, etc. They are assumed. I will be recapping each week the following Monday, including plans for the following week, so my next post on this topic will cover Week 1 and will be on May 11th, with one following each week until June 1st. The menu planning will cover May 3 through May 30th, or 4 weeks. I hope you enjoy my experiment! containers and cutting the use of any plastic bags, aluminum foil, plastic wrap, etc. to almost none. I’ll be anxious to hear what tips others might have. I also prepare almost everything I eat, as you well know! 🙂 The only convenience foods I usually purchase are snack-type foods, because I really like variety in my snacks. I need to work on my paper towel usage, myself. I’m pretty terrible with that. Thanks as always for your comment! Very interesting! We spend so much money on water, but the water here is terrible. I don’t know anyone here that drinks from the tap. We did in Alaska and I never bought bottled water growing up. Hate spending the money, but the alternative is nasty. Can’t wait to read your next entry! We’re very lucky to have good tap water here, but I do know if I lived in Florida I would be buying water because of the sulfur-y flavor. Is that the issue in Texas, too? I have the Ibotta app installed on my phone – I really should start using it to see if I can get anything back 😛 Thanks for sharing this – I cleaned out the cabinets in January but seem to be overloaded again. Time to focus on eating out of the pantry again. I see a split pea soup with ham hock in your future, as well as some sort of pasta with Pop-Pop’s sauce! You have some awesome goodies in your pantry and freezer gf! I personally have a whole turkey in my freezer that I need to cook up…hmmm, Thanksgiving in May?? We did some spring cleaning in our pantry lately and it’s looking pretty bare now. I’m off to the store today to do some replenishing. I notice something I do is wait too long to replenish things. For me, it is easier to buy (needed) things along the way instead of one late bill, which is going to happen today. I might try one of the suggested apps today too! Yeah I’m not looking forward to the first June grocery bill when I restock the meat freezer! 🙂 The iBotta app is my favorite so far. Yes! I’ve heard of this challenge and I love it! I think it’s a great way to bring awareness. 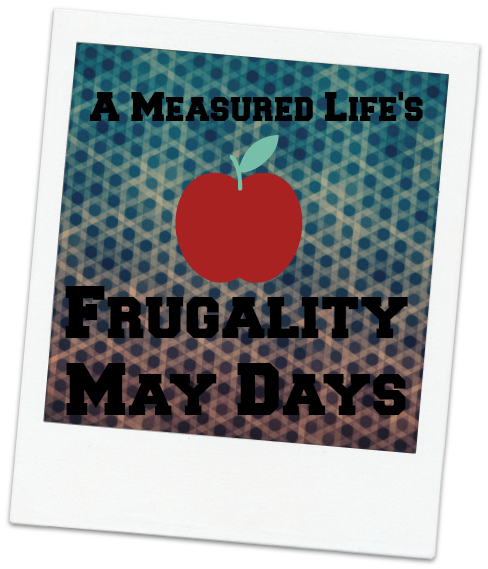 I actually blog about eating well on a budget; I have a $70 weekly food budget for two of us, but $1 a day for 5 days would be a real challenge! Thanks for your comment! I love your post about the max you’re willing to pay for something. I need to do one of those here. Are your chicken prices for organic or regular chicken? I’ve subscribed to your blog via e-mail, lots of awesome stuff there!